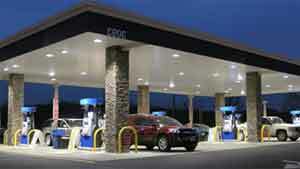 Proper installation and maintenance of outdoor industrial light fixtures can be critical in many business locations. This is especially true at large commercial zones or other areas that people frequent. The list can include anything from shopping malls to hospitals to schools, colleges and universities, hotels, factories and more. Proper illumination of areas outside these buildings including parking lots, walkways, courtyards, shipping docks, etc. are important for many reasons. The first, being safety. When there are dark spots or shadowy areas, this can lead to accidents, injuries and even criminal behavior. When there is not proper lighting and these areas are in the dark, accidents can and do happen. Whether it is someone losing their balance and tripping over something they can’t see, someone falling off the side of a loading dock, someone being attacked or someone spraying graffiti on the building, these incidents can and do happen because of poor industrial lighting. When installing industrial lighting fixtures in outdoor areas it is important to first have an expert on lighting do an evaluation of the area. The expert can help you decide on how far apart lighting should be, how much lighting is needed and what type of industrial light fixtures will work best. Making sure the lighting is of the right level, the right position and angled correctly can make a big difference in proper illumination of the area. When installing outdoor industrial light fixtures you may want to even consider lighting areas that are not frequented by people. Installing motion light detectors around the perimeter of the building is a great way to cut down on theft and vandalism. As a final note, when choosing industrial light fixtures for your outdoor areas, be sure to purchase the latest technology that will provide the highest energy efficiency. While installing the lighting may put a dent in your budget, making sure that the lighting is energy efficient can make up for it in the future.